We help businesses achieve transparency and traceability with Blockchain. Diaspark’s Blockchain Services leverages blockchain and its technologies to address transparency, security and trust challenges in businesses. Our team of experts have experience and capabilities to build the prototypes required for adoption, integration, migration and implementation of blockchain technologies. At Diaspark, our Blockchain services are focused on helping enterprises establish business networks with transparency and trust. 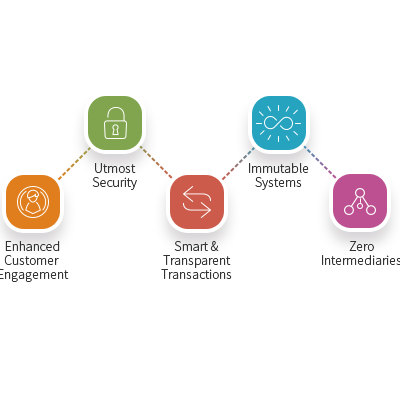 We act as an end-to-end partner for complete Blockchain realization – from advisory stage to the complete development and implementation of the solution. We assess your business processes identifying the potential of blockchain implementation and consult you on the best implementation roadmap. We develop scalable Blockchain framework with custom built features and distributed applications to suit your business needs. Analyzing a company’s existing infrastructure, we move ahead with agile and seamless integration supporting the transition with our toolkit. Our testing services ensure that your Blockchain network is reliable, secure and matches your business needs. Certification Issue – Network-All certification stored in blockchain, so nobody can temper & fraud with certificate. It will reduce the fake certification. Content Rights Management-Blockchain can do copyrights management of training content such as audio, video, text etc. Increased security in claims adjudication and auto-verification made possible by validations. Improved data security for protecting sensitive clinical trials data gathered during phases of research.